I currently work for the Smithsonian Astrophysical Observatory's Submillimeter Array, a telescope located atop Mauna Kea on the Big Island of Hawai'i. The Submillimeter Array is a radio interferometer which collects data from eight 20-ft antennas and combines their signals to provide superior observations of cold dust and gas found throughout our universe. Our telescope helps astronomers answer some important questions: how do stars and planets form, how do stars evolve, and what does the supermassive black hole at the center of our galaxy "look" like? I spend ten nights a month operating the telescope, making sure that we are collecting quality data, assisting our visiting astronomers, and inevitably troubleshooting whatever goes wrong with operations for any given observing run. Additionally, I serve as our outreach coordinator for the telescope, and work with local scientists and teachers on how to provide meaningful educational experiences in astronomy here in Hawai'i. Becoming an astronomer was a dream of mine since grade school, but by the time I graduated from Haverford, I wasn't convinced that I wanted to pursue the path of an academic astronomer. I felt excited about the possibility of working in science education and outreach, and was able to do so through jobs at the NC Museum of Life and Science and the Franklin Institute in Philadelphia. At both these museums, I spent my days developing a myriad of educational programming aimed at inspiring a passion for learning about science and technology. While I love teaching, there was a part of me that missed the problem-solving nature of the research I had conducted throughout my senior thesis and summer research projects. I started looking for positions that could combine my love of outreach with my interest in technical work, and found a good match with the Mauna Kea Observatories. 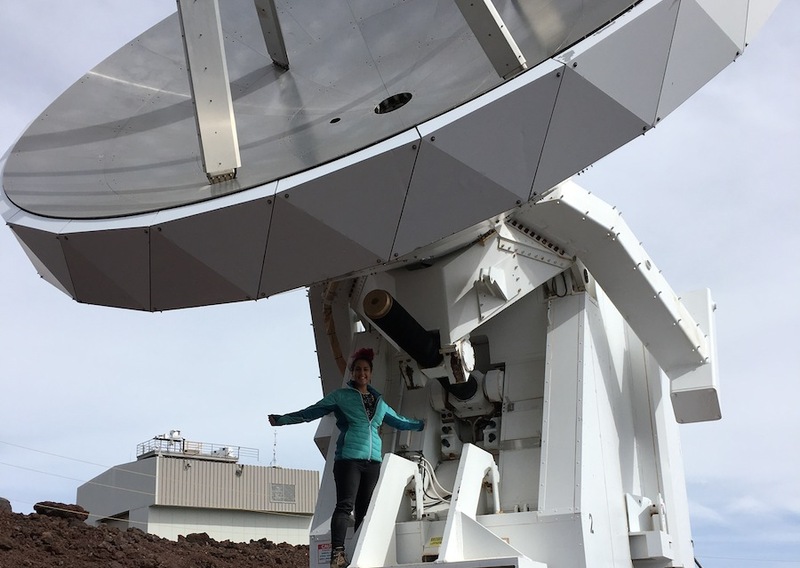 I feel very fortunate that with my work at the Submillimeter Array, I am able to contribute to the field of astronomy by providing astronomers with high-quality observations that could lead to exciting discoveries about the universe we live in. I hope to continue to help patch up (or re-invent) the leaky STEM pipeline that is structurally biased against increased diversity and wider participation in the physical sciences. More so, in an age of climate skeptics and propped-up fears of GMOs, I intend to continue working as an interpreter between scientists and the general population to help our communities become better informed and more comfortable with scientific and technological progress. When I think about decisions that I made that altered my professional path, the moment that instantly comes to mind is accepting a summer research position with Dr. Beth Willman after my first year at Haverford. While I really enjoyed my initial course in astronomy, I had already internalized a lot of common stereotypes of what it means to be a scientist, and believed that my enthusiastic and outgoing nature wasn’t suited for a professional career in astronomy. Yet after working with Beth, I discovered that a healthy dose of creativity is necessary for conducting cutting-edge research, and that computer programming wasn’t a bore, but rather an exciting logic puzzle. I realized that the personal traits that I had previously considered as weaknesses, are indeed assets and could be used to my advantage as a member of the science community. This sparked an interest in working both as a scientist and as an outreach professional. I am guided by Beth’s mentorship as I help support other individuals who are interested in science but feel excluded from or daunted by the traditional path to becoming a scientist. In addition to providing an excellent and rigorous training in the physical sciences, Haverford offered so many unique opportunities that shaped my professional interests and career path. When I was looking for a summer research position after my sophomore year, Haverford alum Andrew West '99 welcomed me into to his research group at Boston University, and ignited my interest in M dwarf stars which later became the topic for my senior thesis. During my senior fall break, my observational astronomy class went to Kitt Peak National Observatory and collected data for our own research project. This was perhaps one of the most exciting educational experiences during my time at Haverford, and gave me a glimpse of what it would be like to work at a research observatory. Haverford brings together so many inspiring individuals and fosters a collaborative environment dedicated to helping each other learn for learning’s sake. Rooted in our shared values and ethics, so many of my friendships that began at Haverford have continued to flourish, evolving into a strong personal and professional network. We celebrate our achievements, we commiserate together and discuss how to tackle injustices seen in the workplace, and we support each through the highs and lows of our personal and professional lives. I never cease to be amazed by all that my Haverford friends are accomplishing!